Taste test: When Doritos came out in the '70s, I remember them having a yellow tortilla chip. If you liked those, then you'll love these. These chips are huge! About the same size, if not bigger, of the Restaurant Style Tortilla Chips that are the norm these days. 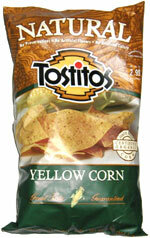 These have a good crunch, and a little bit less salt, than normal tortilla chips. They will also remind you of taco shells, which can be a good thing, as these will be better for nachos or taco salad should you run out of taco shells on taco night. Smell test: Nothing that knocks you out, kind of a stale smell.